Yarn-aholic in T.O....: What's up with Britney Spears???? 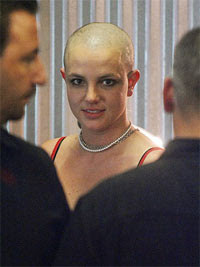 What's up with Britney Spears???? So here's my question - Why would this self made young woman a) marry such a loser as Kevin Federline and b) why in G-d's name would she shave her hair off? I found the recent publicity surrounding BS, quite disturbing probably because a) she had everything going for her, b) she obviously found the disolution of her marriage quite damaging c) she has been doing a lot of irrational and obviously ill-thought out act - a bit of an attention seeker and d) has slipped inot a repeat-offender self destructive individual. I feel sad for her, only because she has lost her grip on reality and this may potentila affect her kids, and they didn't do anything to deserve that. Hopefully she willcheck into another rehab soon and deal with whatever is eating her. March 16, 2007 at 11:49 p.m.